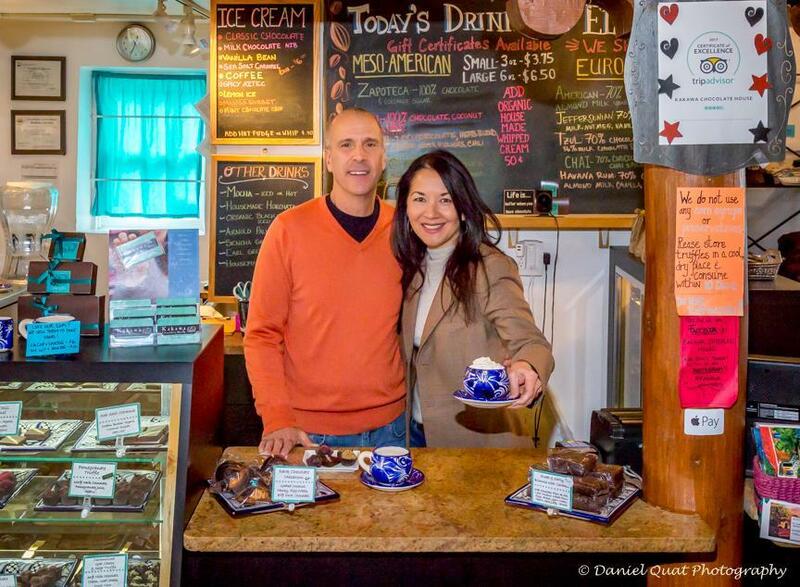 Bonnie Bennett and her husband, Tony, own and operate the Kakawa Chocolate House in Santa Fe. They will open their second shop in Salem, near the Peabody Essex Museum. A jewel in the culinary crown of renowned food city Santa Fe will be opening here in Massachusetts. Later this fall, Kakawa Chocolate House will bless Salem with the chocolatier’s second location. Kakawa is no mere candy store: it is a soul-satisfying, immersive chocolate experience that will clobber you over the head with bold flavors and leave you weak in the knees and high on theobromine. Specifically, it is a combined cafe and retail shop where cups of drinking chocolate — referred to by the staff as “elixirs” — take center stage. Many other offerings are available, from blueberry-basil truffles to brownies bedeviled with chile powder. The original Kakawa is located in an adorable adobe building not far from the Santa Fe plaza. To approach, patrons pass through a gantlet of lengthy, red ristras, as the strings of decorative dried peppers are called. An omnipresent blast of high-altitude sunshine imbues the exterior and its adjacent patio with a warm glow. Weathered wooden beams painted bright turquoise contrast the earthen hue of the mud brick plaster, and as soon as the cafe’s carved wooden door swings open, it is replaced by an aroma wall of chocolate and spice. The Salem expansion will feature similar charm thanks to its home in a historic building on Essex Street. As at the original location, traditional, hand-painted tin art will hang on the walls, and guests can lounge in wide-backed, equipale chairs made of leather and unfinished wooden slats. Blue-and-white floral-patterned Oaxacan talavera mugs, which nicely offset the dark brews within, will make the trip as well. More importantly, the menu will too. Kakawa serves a total of 16 drinking chocolates; between six and nine are listed at any given time. This “elixir” menu is divided into Mesoamerican and European sections. Under one you’ll find options such as the “Chili,” with unsweetened chocolate, agave nectar, ancho chile, and vanilla. On the other side are drinks like the “Marie Antoinette,” with 70 percent chocolate, orange blossom water, Ceylon cinnamon, and almond milk. Organic, in-house whipped cream can be added to any drink, and some come with a sprinkling of oily, crunchy cacao nibs. Even a small serving size has a potent effect, but not likely because of a sugar high. Most of the drinking chocolates are only lightly sweetened, and some contain no sweetener whatsoever. These, such as the richly bitter “Aztec,” have more in common with espresso than the milky, sugary hot chocolate many Americans might expect. “Are you ready to come over to the dark side?” is a question frequently asked by the staff. Kakawa also makes it a point to exclude other ingredients common in commercial chocolate, such as preservatives and corn syrup. Many of the cafe’s offerings also lack gluten and dairy, though neither are missed. After taking in the chalkboard drink list, one’s gaze inevitably lowers to the treasure trove that is the confection case. Here are items such as mezcal truffles, white chocolate macaroons with lemon and pistachio, and rose-flavored caramels. “There’s not a lot that’s super subtle, and we like to challenge people,” says Bonnie Bennett, who has co-owned the business along with her husband, Tony Bennett (not that one), since acquiring it from a previous owner seven years ago. “When we say ‘goat cheese’ we get some faces,” she notes, referring to a truffle prominently featuring that ingredient. “But 97 percent of people who make that face try it and say ‘Yum, that was amazing.’ ” The truffle is made by cooking goat cheese into the ganache, resulting in a flavor similar to the Mexican goat milk caramel called cajeta. A pretty spray of green sage dust tops it and adds an herbal, regional note. Another case displays more purist options, such as coins of unadulterated, house-brand chocolate imprinted with images adapted from Late Classic Mayan glyphs. Kakawa’s own ice cream and cold drinks such as horchata and chocolate soda are also sold. Consistent strength across the menu distinguishes Kakawa beyond the success of any single item. The brownies are as excellent as the drinking chocolate, and the horchata is as impressive as the dried chile de arbol dipped in chocolate and caramel. The heat from that pepper is only somewhat abated by its coating, whose sweetness fades before your endorphins take effect: in the lull, you can enjoy some deep breathing. An ice cream flavor called “mint chocolate nib” is simultaneously bright and skunky, thanks to peppermint oil paired with an heirloom mint varietal grown by one of the bakers. The selection of caramels exhibit such a profound depth of flavor that your first reaction is not “Mmm” so much as “How can this be?” Superlative truffles, ice cream, drinking chocolate, horchata, and macaroons are all here under one roof. The Salem location will import Southwestern charm while embracing its new surroundings. “[We’re] not trying to re-create an adobe house inside a 1800s New England structure,” says Bonnie. Recipes that “nod to the area that we’re in” will include new ice cream flavors, among other offerings. “We’re looking at ingredients that are indigenous and/or local to the area, whether it’s berries or something that represents historical events or characters that enjoyed chocolate as well,” says Bonnie, hinting that cranberries may be involved. Like so many New Mexican dining establishments, Kakawa liberally threads chile pepper throughout its menu. While such heat is expected in Santa Fe, it might do more good in a state with fewer days of omnipresent sunshine.